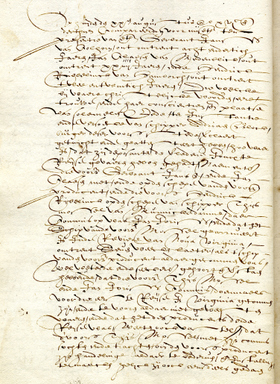 | Click to view larger image | 1613 deposition by three crew members from ships owned by Adrian Block and Thijs Mossel mentions "a mulatto born in St. Domingo" who left Mossel's ship and stayed in the vicinity what would later become known as New Amsterdam. “Juan Rodriguez and the Beginnings of New York City,” a monograph revealing information on the Latino identity of the first immigrant to settle in New York City, will be released to the public Wednesday, May 15, by the CUNY Dominican Studies Institute (CUNY DSI). Rodriguez, who was also known Jan Rodrigues, arrived in what was known as Hudson’s Harbor in 1613 and stayed until 1614. Historical records identify Rodriguez as a black or mixed-race male from the island of Santo Domingo, the first European colony established in the Americas following Christopher Columbus’ 1492 voyage. As a black man from a Spanish colonial society, he can be considered an ancestor or, at least, a predecessor of New York City’s black and Latino communities, said Dr. Ramona Hernández, director of CUNY DSI and professor of sociology at The City College of New York. The team’s methodology consisted of five stages: (1) digging up documents from archives in Holland and the Dominican Republic about Rodriguez and his relations with the Dutch as well as his own society of origin; (2) transcribing Dutch and Spanish documents; (3) translating Dutch and Spanish documents into English; (4) summarizing the scholarship on Rodriguez, i.e., what had been said about him until now; (5) presenting an analysis that intertwines all documents found, previous studies and the historical context of La Española society as maker of a man of Juan Rodriguez’s character. The central thesis of this research is that Juan Rodriguez’s profile as described in Dutch documents – a free, dark-skinned and assertive man who had a relationship with Dutch sailors in 1613 – seems very typical of a former inhabitant of early 17th century Santo Domingo. In 1613, la Española was a very well defined society, and blacks and persons of mixed race comprised the majority of its population. Similarly, La Española was a society where widespread systematic smuggling and illicit trading with foreigners, including the Dutch, was a fact of life. Interactions among peoples from inside and peoples from outside developed into strong social relationships and exchange of cultural practices, including language and other ethnic symbols. In addition, Juan Rodriguez’s strong-minded decision to stay in New Amsterdam reflects the character of an individual who came from a society, like Santo Domingo, where people lived in clear violation and defiance of the Spanish Crown. The New York City Council and the American Chamber of Commerce of the Dominican Republic partially funded the research.